What a whirlwind of a tournament! The schedule had called for this one to conclude tomorrow, but the pace was fast enough that all was decided tonight, thanks in large part to the young German Dominik Nitsche storming through the final table to win his first WSOP bracelet in Event 59: $1,000 No-Limit Hold'em. Today's Day 3 began with 51 survivors from the starting field of 4,620 still battling for the bracelet. Play moved quickly through the first four levels, with that field being trimmed to 29 after two hours, then down to 16 after four. Among those hitting the rail by then were Event 1: $500 Casino Employees No-Limit Hold'em winner Chiab "Chip" Saechao (39th), Jake Cody (35th), Thomas "GnightMoon" Fuller (30th), and Aditya Agarwal (19th). It would take another couple of hours to play down to nine, with David Steirman (16th), James Taylor (15th), Yoav Tenenbaum (14th), Daniel Thomas (13th), Hieu Nguyen (12th), Joshua Prager (11th), and Iakov Onuchin (10th) all making deep runs but falling just shy of the final table. By then Nitsche had already assumed a commanding chip lead, and once the final table began he immediately taking the initiative, opening most pots and quickly creating distance between himself and the rest of the pack. Eventually the short stacks would start pushing in, and Nitsche was there to pick them off. First it was Daniel Eichhorn falling with to Nitsche's to go out in ninth. Soon after it was Jonathan Miller taking his chances with against Nitsche's pocket kings, and when Miller's hand failed to improve they were down to seven. Pocket kings would also be the cause of Martin Vallo's demise in seventh place, with Jonathan Hilton using them to best Vallo's pair of sixes. Then Then Frankie Johnson would be the next to try his luck against Nitsche with only to see the chip leader turn over a familiar hand — . Five community cards later Nitsche's hand was still best, and with five remaining Nitsche had amassed more than half of the chips in play. The Nitsche steamroller would keep going, gathering two more eliminations before the end of Level 27. First a short-stacked Randy Lanosga reraised shoved with pocket sixes over a Nitsche open, but the latter had and soon Lanosga was on the rail. Then Sebastien Comel called a Nitsche five-bet shove with and was racing against Nitsche's pocket nines, but the board rolled out eight-high and Comel was out in fourth. Finally they reached the end of the level and the break. Nine players had been sitting around the table an hour before, but now they were down to three. And Nitsche had almost all of the chips, with more than 10.5 million while Alex Cordero and Jonathan Hilton were each sitting with less than 2 million. It was shortly after play resumed that the two short stacks went to battle, with Alex Cordero committing the last of his stack on a board holding (queens, a flush draw, and a gutshot) against Hilton's (aces). The river was the , Cordero's run had ended in third. Heads-up play began with Nitsche well in front with nearly 10.5 million to Hilton's 3.4 million. Whereas Nitsche had been a front runner most of the day, Hilton had mostly battled his way to the final two with a short stack, and in fact at one point had appeared destined for a 15th-place finish until a lucky river card kept him in the tourney. Hilton would ultimately duel with Nitsche for about an hour, although never was able to add much to his stack, and soon found himself down below 1 million. He'd survive through several double-ups, but Hilton was low on chips again when he at last called Nitsche's all-in shove and hoped his would hold against Nitsche's . The board then came , that river nine giving Nitsche a better straight, and in one day they had played down from 51 players to just one. Nitsche becomes the second German player this summer to claim a bracelet, joining his countryman Jan-Peter Jachtmann, winner of Event 39: $10,000 Pot-Limit Omaha. 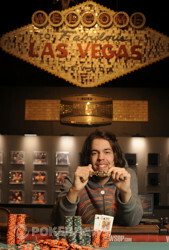 In just three years, Nitsche has had a lot of tourney success all over the world, with a Latin American Poker Tour title, numerous cashes all over Europe and in the European Poker Tour, a World Poker Tour final table (in Marrakech, Morocco), and now a World Series of Poker bracelet! 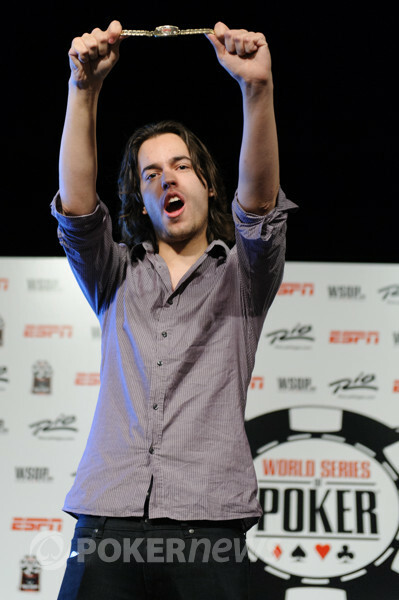 Congratuations to Dominik Nitsche, Event 59 champion! 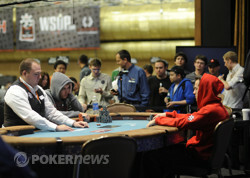 And thanks to all for following our coverage here on PokerNews. Be sure to check in on the Main Event, already underway! Jonathan Hilton battled with a short stack against Dominik Hilton for well over an hour, but alas for Hilton, Nitsche was finally able to win an all-in and take the last of his chips. In the last hand, Nitsche open-pushed all in with , and Hilton called quickly for about 1.4 million worth with . Hilton was still best through the flop and turn. Then came the river... the ! Both players made straights, but Nitsche's was best. Nitsche recognized he'd won a moment before his large rail of supporters did, shouting first, then was soon followed by a chorus of cheers and hugs from the crowd. Soon Nitsche was congratulating Hilton for a well-played tourney, and Hilton was congratulated in turn by those here supporting him. Dominik Nitsche pushed all in from the button and Jonathan Hilton called to put himself at risk. Hilton had Nitsche dominated and the board kept him in front for the double to 2.2 million. On the very next hand after being crippled following that river call, Jonathan Hilton was all in before the flop on the next hand with against Dominik Nitsche's . The board rolled out , and Hilton survived. 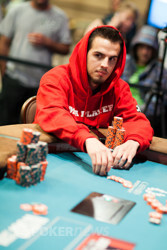 Jonathan Hilton, his red hoodie covering his head, raised to 125,000. Dominik Nitsche, looking out from underneath a gray hoodie, reraised to 350,000. Hilton called. The flop came . Nitsche led for 375,000, and after thinking about a half-minute Hilton called. The turn was the , pairing the board. This time Nitsche bet 625,000, acting quickly as before, and Hilton though about a full minute before gathering chips into a column and pushing them out to call. The river was the , and Nitsche took just a few seconds before putting out a bet of 1.5 million. Hilton considered for three or four minutes, counting out his chips to see that if he called and lost, he'd be left with less than 1 million. Finally Hilton did call. Nitsche showed his , and Hilton grimaced slightly as he showed his . Nitsche had three-barreled, but it turned out his hand was best. Jonathan Hilton has been winning his fair share of pots lately. In a recent pot. Dominik Nitsche opened to 125,000 and was called by Hilton. The flop came and Hilton led out for 155,000. Nitsche made the call. Both players checked the turn, however, when the completed the board, Hilton fired 300,000 and change and Nitsche quickly folded. Dominik Nitsche raised to 125,000, and Jonathan Hilton fairly quickly reraised to 275,000. Nitsche only waited a few seconds before saying he was all in, and Hilton called right away. The flop was good for Hilton, coming . The turn and were even better, ensuring him a double-up and survival. 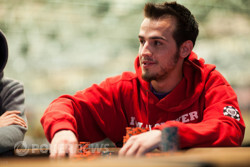 Dominik Nitsche has been slowly, but surely, grinding away at Jonathan Hilton's stack. In a recent hand, Hilton completed from the button and Nitsche checked his option. The flop came and Nitsche led out for 65,000. Hilton called. The turn brought the . This time, Nitsche led out for 165,000 and Hilton again called. The completed the board and both players checked. Nitsche flipped over for a pair of tens and it was good as Hilton mucked. Hilton is down to his last 1.9 million. Jonathan Hilton opened with a raise to 125,000 from the button, and Dominik Nitsche responded with a three-bet to 350,000. Hilton then made it 725,000 to go, and Nitsche didn't waste a lot of time before declaring he was all in. Hilton considered the situation for a few moments, then let his cards go.